ModalInput layers on top of Modal and allows you to build a form that asks the end user to send single-line or multiline text to the server. The server can customize the form in a number of ways, and can wrap the resulting data to facilitate parsing when it receives it. The server can also specify a string to be sent when the modal input form is cancelled. 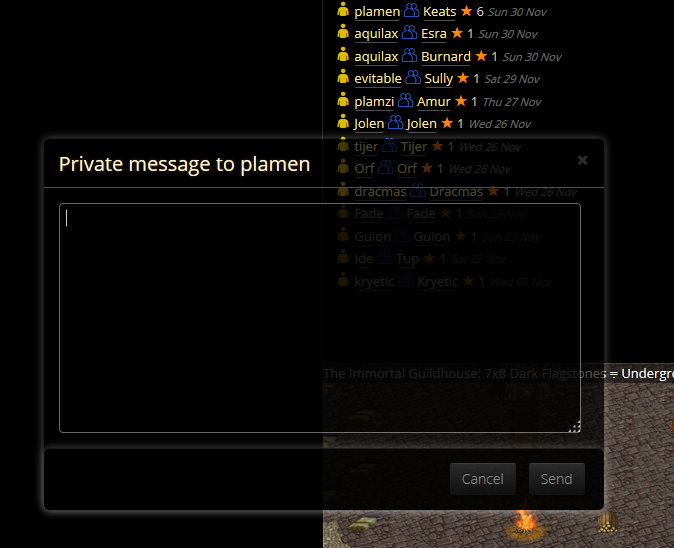 title Title that should be displayed in the toolbar of the dialog. tag The tag type of input field. Default is 'textarea' but you can set it to 'input'. type The type of input field. If you set tag to 'input', here you can specify 'text', 'password', or 'email'. attr Special attributes invoking custom input forms. Currently accepted values are 'reset' and 'change', which create a form with two password input fields and check that the values are matching before sending the data to server. text Optional text to be displayed prior to any input field. This can be simple text or HTML with ESC in front of < and > chars. mxp Text containing MXP interactive anchors (and / or ANSI colors) to be displayed before the input field(s). info Optional notification to be displayed in the header of the modal inside an info box. error Optional message to be displayed in the header of the modal inside an error box. closeable Default is true. If set to false, the dialog will not have an 'x' in the top right corner. closeText The text of the button that dismisses the modal. Default is 'Cancel'. If an array of 'buttons' is given, this option has no effect because the default button is blown away. sendText The text of the "Send" button. backdrop Set to false to not display a dark backdrop for the modal. Set to 'static' to prevent clicks on the dark backdrop from dismissing the modal dialog. Default is true. css Optional object containing CSS properties such as width and height to be applied to the modal dialog. Last Edit: 26 Jun 2015 04:51 by plamzi.